Geared with 40,000 pixels and 7,000 nits per sqm, exceptionally consistent colors, the ultimate, IP65 water resistant P5 SMD LED display panels are a superior solution for digital out of home (advertising), outdoor branding requiring super high resolution at closest viewing distances. 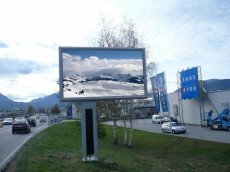 It is a perfect choice for both rental (mobile) and fixed installations especially for vehicles and light boxes/posters. The best price above is based on 1 sqm with top quality materials, FOB Shenzhen terms, and it does not include the control system such as Linsn, Novastar, Colorlight, Dbstar, etc. The production time with aging test is 22 days.